The first time I heard of GIMP was in the year 2000 when I was in a web development company and one of our casual conversations shifted to alternatives to Photoshop which is a powerful but rather expensive tool. It is good to know that GIMP is still going strong! 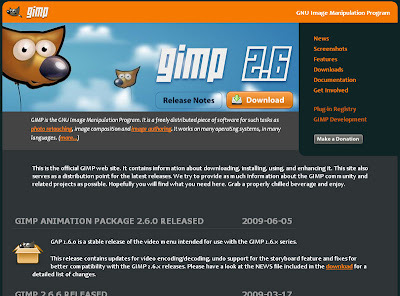 GIMP stands for the GNU Image Manipulation Program. It was developed under X11 on a UNIX platform, but it is also able to run on Windows and Macs. I have not personally used it myself, since it has always become a rather fortunate circumstance that I always have Photoshop made available in my line of work, but GIMP is surely something I will like to tinker on when the opportunity (or the need, whichever comes first) arises. It has tools for painting, image manipulation, even animation! It also supports a wide range of file formats including - surprise! - PSD. This is certainly something to consider when you need a graphics program but on a tight (or no) budget.